Forget about the Marriott, Hilton or any other number of hotel chains scattered around U.S. airports, the next big name in lodging could be an airline. JetBlue Airways is reportedly in advanced negations to turn a landmark terminal at New York’s John F. Kennedy International Airport into a hotel. The Wall Street Journal reports that the new venture – a partnership with hotel developer MCR Development LLC – would transform the historic TWA terminal, designed by renowned Finnish architect Eero Saarinen, into a modern hotel for traveling consumers. 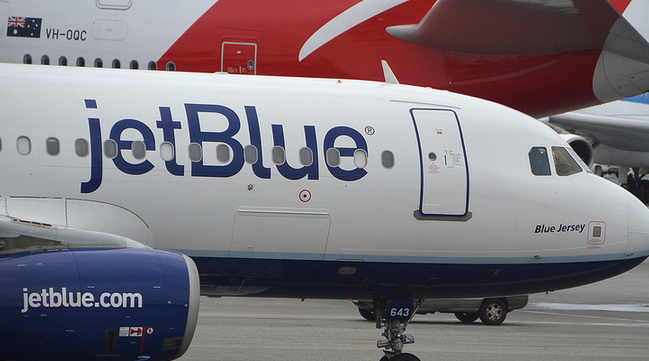 Talks between the two companies and the Port Authority of New York and New Jersey could still fall apart, but a source close to the deal tell the WSJ that JetBlue and MCR are currently the preferred bidders for the project. Revamping the TWA terminal has been an ongoing project since the building closed in 2001. In 2008, the Port Authority invested $20 million to rid the area of asbestos and restore its interior. Back in 2013, Hotelier Andre Balazs won the rights to develop a hotel in the terminal, but he eventually dropped out of the project, the WSJ reports. That’s when the Port Authority relaunched the bidding process last year, and narrowed the potential developers to two groups. Sources tell the WSJ that if JetBlue and MCR win development rights, their project would include 500 rooms and would be located across from JetBlue’s main terminal. In a way, it makes sense for an airline to jump into the airport hotel business. Analysts tell the WSJ that the lodgings have been p to generate stable business from travelers and airline personnel and have grown in popularity for many business travelers who prefer a quick turnaround, rather than traversing into city centers for meetings. While many travelers might think of simple, no-frills hotels when they think of airport lodging, the newer developments have taken on a luxurious nature. For example, a developer is set to break ground on a $100 million hotel at the Minneapolis-St. Paul International Airport. That property will include a spa, swimming pool and roof deck bar. An airport hotel developed by Westin is slated to open in Denver later this year. That 519-room property is expected to host concerts, festivals and art shows. The biggest hurdle that JetBlue and MCR face, besides the stiff competition for TWA’s terminal, is gaining the approval of the Federal Aviation Administration, which governs airport locations. The WSJ reports there are numerous restriction around security and dimensions for possible lodging projects.